What's the best wearable device you can get? Microsoft has taken the wraps off of its latest and greatest wearable device, an updated version of the Microsoft Band. The fitness tracker/smartwatch combo looks to be even better than the hit that was the original Microsoft Band, featuring improved fitness tracking capabilities and a number of new smart wearable features. Microsoft, however, isn't the only company that's been working hard in the wearable market.Samsung recently announced the Samsung Gear S2 and, but if we're going to talk about wearables, it would be hard not to include the Apple Watch, a device with fitness features Apple doesn't shy away from promoting (there's even the rubbery strap for the Apple Watch Sport edition that's suited exercise). Of course, it's important to mention that the Microsoft Band is positioned as a fitness tracker, while the Samsung Gear S2 and the Apple Watch are both smartwatches that have some fitness features. However, each are flagship wearables with top-notch hardware and software, which evens the playing field. If you're having trouble deciding which device best suits your needs, read on as we compare the most important features of each against the others. The new Microsoft Band has an improved design with a curved display. Generally speaking, the Band offers a simple, sporty design, including a flat black strap that hooks together with a subtle clip. The Samsung Gear S2, by comparison, looks like a real watch. It has a round face and offers a sporty design with the band itself made of plastic, a design element that helps it flow well into the main body of the device. Some would argue the Gear S2 is one of the best designed smartwatches on the market. It's also fairly thin, coming in at 11.4mm (0.45 inches) thick. The Apple Watch really is one of those devices that looks better in person than it does in pictures. It offers a square display, which seems to be out of fashion for wearable devices of late, however the multitude of color and band options is certainly a plus. The Apple Watch is a little thinner than the Gear S2: it measure 10.5mm (0.41 inches) thick. It's difficult to compare design of a device that's clearly a fitness band with the design of a smartwatch. It's even difficult to compare a round smartwatch with a square one. While it really comes down to personal preference here, for a subtle fitness tracker then the Band is the best option in terms of design. 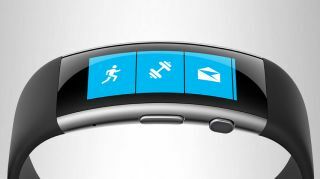 The new Microsoft Band display is 32mm x 12.8mm (1.26 x 0.5 inches), a rectangular display indeed but one that seems to work great considering the device is a fitness tracker. The display's resolution is 320 x 128 pixels. By comparison, the Samsung Gear S2 offers a display that's 1.2-inches across, has a resolution of 360 x 360 pixels and a pixel density of 302 pixels-per-inch. Finally, the Apple Watch is actually available with two display options. The first is 38mm (1.5 inches) diagonal, with a resolution of 340 x 272 pixels. The second display is 42mm (1.65inches), and has a resolution of 390 x 312 pixels. When all's said and done, the Samsung Gear S2 has the densest and therefore crispest display. Microsoft hasn't listed the processor, storage capacity or RAM on the Microsoft Band, so it's impossible to judge it on those front. Exynos processor, and the Apple Watch features an Apple S1 chip. It's a little hard to compare the two at this point because of the fact that Apple doesn't generally offer much information about its processors. As far as storage goes, the Samsung Gear S2 has 4GB, while the Apple Watch packs 8GB. Both devices offer 512MB of RAM. The Samsung Gear S2, meanwhile, offers a 1GHz Exynos processor, and the Apple Watch features an Apple S1 chip. It's a little hard to compare the two at this point because of the fact that Apple doesn't generally offer much information about its processors. As far as storage goes, the Samsung Gear S2 has 4GB, while the Apple Watch packs 8GB. Both devices offer 512MB of RAM.